November is National Alzheimer's Disease Awareness and National Family Caregivers Month. Caring for someone with a form of dementia is stressful. According the National Alzheimer's Association, more than four in five caregivers would have liked more support in providing care for someone with dementia, especially from their family. With millions of Alzheimer's caregivers across the country, that leaves a lot of people in need of support. When our grandmother began to experience these symptoms, she refused to see a doctor and was increasingly unable to move around, let alone leave the house. I would turn to meditation, to prayer, to yoga, and to my sister and friends for comfort and relief from the stress I was dealing with. My mindfulness practice deepened and it helped me to keep my temper and to find solutions to keep our grandmother comfortable at home as long as possible, as was her wish. If you are a caregiver, try to incorporate more mindful awareness to your days to bring some semblance of calm when you need it most. Here's some information from our friends at Encore in the UK on Dealing with Dementia and important steps to take if you are a caregiver. When I began the Plastic Free July Challenge, I did not realize that I was going to connect with so many people who are also interested in going plastic-free and zero-waste living. I’m happy to be a part of such a growing community that believes in the power of personal action. Fillgood mission is to help people reduce single use plastics at home. Recycling is not a sustainable solution for plastics. We need to adopt plastic-free alternatives that won't pollute our environment forever. That's what inspired me to start Fillgood. I've selected all natural and safe home and body products, in a reusable or compostable packaging. You can also find the basic zero waste items like reusable utensils, straws, produce bags... And finally, what makes us unique, a local refill service: just like the milk man used to deliver milk in american homes and collect empty bottles, we deliver laundry detergent, dish soap, skincare products and more. The empty bottles are cleaned, sanitized and refilled. So far, thanks to our zero waste customers, we have avoided 1084 lbs of plastic packaging! What inspired you do to the July Plastic Free Challenge? When I started reducing waste at home for my family of 4, I changed the products I was using since they were all packaged in plastic. For example, I stopped purchasing liquid shampoo because 552 million plastic bottles of shampoo are discarded every ear in the US! Instead, my family uses shampoo bars: that's easy to use and avoids so much plastic waste. A Plastic Free July Challenge was a great opportunity to learn what we can all do and be inspired, so I shared almost everything I know in these 31 blog posts, co-written with Zero Waste California. In this journey in the zero waste community, I realized there are so many little changes we can make everyday, easy changes that make a real difference for our environment. In addition, changing our lifestyle to be respectful of our beautiful planet is also a way to be happier everyday. It's impossible to change everything at once but as I say all the time, start somewhere, pick one thing from the challenge and when you've found your plastic-free alternative, start another one. It's a step by step process. What are three things you learned from the Plastic Free Challenge? My daughters are too old for diapers but I learned a lot about cloth diapers. Although it's a big challenge, it's less complicated than I thought. And this was an opportunity to make my own diaper change lotion, which is actually an excellent makeup and face painting remover! When it comes to shaving, the main zero waste solution people talk about is razors. Personally I prefer waxing, so I found an all natural sugar wax recipe and it's awesome! What are three things you will continue to do? Purchase plastic free makeup products: I've just found great brands online, now I'm in the testing phase, but I won't go back to plastic packaging. Bring my own containers for food leftovers: each time I'm going to a restaurant, I'm trying to remember to bring a stainless steel container. I hate to waste food and I don't want to get stuck with another plastic to go box. It's a work in progress. Same when I order on the go: hot food in a plastic container is very unhealthy, toxic plastic additives leach into the food. A good old mason jar will perfectly do the job! Refuse single use plastics more and more, especially all these little plastic things we receive as "gifts": samples, little toys, balloons... these can never be recycled, they are pilling up in our environment. Refusing is the most efficient solution to stop the plastic pollution crisis. Every week until August 30th we will give away one these beautiful Reusable Cotton Produce Sacs. We’ll draw a winner every Thursday of August: the 9th, 16th, 23rd and 30th! Orders and newsletter signups considered are the ones placed the week before. For example, on Thursday 9th, we’ll take into account the orders and signups placed between August 2nd and 8th. Entrants must have a US shipping address. A winner will be randomly selected, must not be affiliated with Instagram or Facebook. Giveaway closes on Wednesday August 29th at midnight. The best way to reduce plastic pollution is to refuse, rethink, and reduce what we consume. Check out fillgood.co for your Zero Waste shopping needs and follow on instagram! October is here, and my kids are in full back-to-school mode. Math, Reading, and Science are all part of the curriculum at our school, and so is mindfulness. While there are many mindfulness programs aimed at adults, more and more schools are bringing Mindfulness, Kindness, and Social Emotional Learning into the classroom. The school environment can be very stressful as kids deal with issues from home, bullying, and performance in class, etc. Having a mindfulness program in school can help change this environment. At my children’s charter school here in Truckee, CA, we are lucky to have a program called Life Ingredients, which empowers kids to navigate their days with a greater sense of calm. Life Ingredients provides daily audio lessons that teachers play for their students. Each morning my kids listen to a five-minute audio session to start their day. 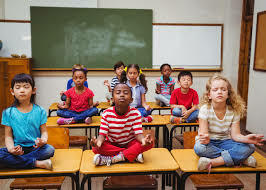 Mindful.org offers ways to contact the teachers and administrators in your school to add mindfulness to your school’s curriculum, but, as always, the best way to teach children to be mindful, is to demonstrate mindfulness in our own homes and in our daily lives. Does your school offer mindfulness program? We would love to hear about it. With summer ending I am looking forward to the inward-focus that comes with the cooler days of Fall. It's a great time of year to start some grounding health practices. I am so excited for the latest Meditation from Oprah and Deepak, Making Every Moment Matter. Tap into your inner wisdom to let goof things that no longer serve you, and transform your perception of time to feel less stressed and more purposeful. I have now done around 9 of these 21-Day Mediation programs by Oprah and Deepak and I love these challenges because they are free, easy to use and always provide such a wonderful source of inspiration for my meditation practice. The Challenge starts on Oct 30th. 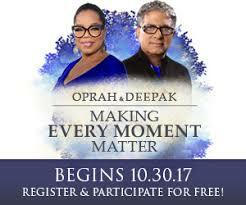 Join Oprah and Deepak to create a life filled with experiences, people and moments that truly bring you joy, sign up today! Spring is here, and this year Oprah and Deepak are working to build a wellspring of hope andbecome more mindful at at the same time. Check out the newest 21-Day Meditation Challenge from Deepak and Oprah. Hope in Uncertain Times. I have nowdone around 7 of these 21-Day Mediation programs by Oprah and Deepak and I love these challenges because they are free, easy to use and provide such a wonderful source of inspiration for my meditation practice. I started the 21 day challenge this week. I have been feeling pretty overwhelmed lately and this could have not come at a better time. This challenge has a focus on how to embrace uncertainty as an opportunity to grow and evolve. We are only on day 3, but I’m feeling more centered already. I try to meditate first thing in the morning before the kids are up and business of the day has started. I have to admit, waking up at 6am has not been easy, but once I am up and start the day with Oprah and Deepak, I am grateful for this mediation. You can still sign up for the challenge here. One question I get a lot is: what exactly does it mean to be mindful? Mindfulness has received a huge amount of attention, but what does it really mean to your day? Do mindful people live differently? Are there practices we can follow to become more mindful? Jon Kabat Zinn defines mindfulness as: Paying attention; on purpose, in the present moment, and non-judgmentally. You can hear more from Jon Kabat Zinn on mindfulness on this You Tube video. Mindfulness allows us to create an awareness and gain greater clarity in our daily lives. It isn’t just meditating in the morning, although that is also recommended. You can practice mindfulness while shopping, working, eating or talking to a friend. Anyone can learn mindfulness from young children to adults. You can practice it anywhere and its always available to you. · Get out and walk, preferably in nature. Greenery helps us focus. · Create something - from knitting to art to writing, whatever inspires you. · Breathe – remember to check in with your breath from time to time during the day. · Stop multi-tasking – one thing at a time allows you to concentrate. · Take electronic breaks throughout the day. Better yet, sleep with your phone in a different room. This site if full of inspiration on how to be more mindful in your life. We would love to hear from you, how do you practice mindfulness in your day? We all recognize the benefits of yoga and meditation, but it’s often hard to find time to practice. But what if you could devote days to this endeavor? Taking off time for a wellness retreat allows you to focus on taking your practice to the next level and provides the schedule for you so there’s no question about skipping yoga class today. I spent time looking at a variety of yoga retreats, and you can find them all over the world. You can find reviews everywhere. Both Goop and Book Yoga Retreats offer a good look. You can go upscale at a swanky hotel in France or stay at an ashram with dorm room facilities in Boston. You can spend a weekend or a month. You can take special courses or just show up for daily yoga sessions and use the rest of your time as you please. You can even incorporate volunteerism into your stay. Some places are all-inclusive with lodgings and meals, and others don’t -- so think about what you want from the place you choose. Some have strict rules about what eat so take that into account when you are looking. Many offer silent retreats as well if that is something you are interested in. Living in cold weather at this time of year, I’m thinking of going south to the Caribbean or Mexico for a few weeks. Two programs that look interesting are yoga at a program and at the Sivananda Ashram Yoga Retreat at Paradise Island in the Bahamas and Rancho La Puerta right over the border from San Deigo in Mexico. Unlike many of the retreats I researched, these two seem easy to get to from my location, and you can choose from different types of accommodations. They offer many different programs, or you can sign up for a basic Yoga Vacation package which includes of daily yoga practice, a healthy vegetarian diet, silent meditation sessions, and uplifting teachings. Have you taken a yoga retreat? Tell us about your experience!